Crypto1CoinBlocker ransomware uses sophisticated techniques to infiltrate computers and hide from its victims. Use Reimage to determine whether your system is infected and prevent the loss of your files. How to recognize this ransomware and prevent its attack? Prepare for the Crypto1CoinBlocker removal! 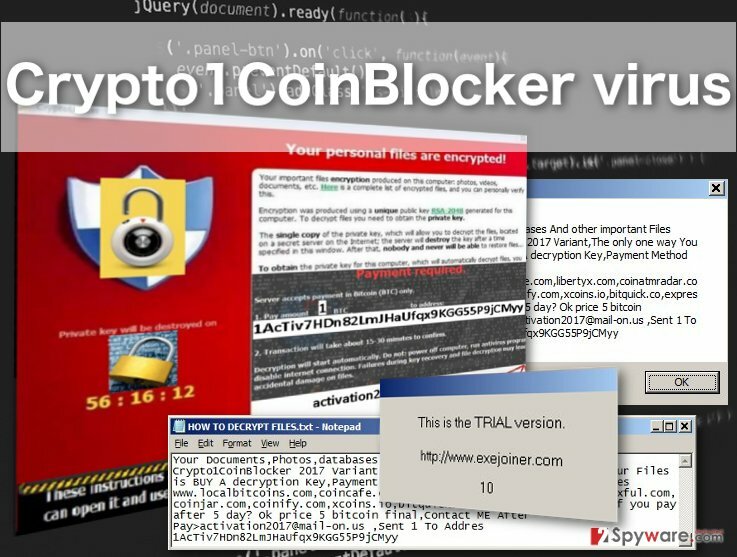 Crypto1CoinBlocker virus is a new version of the Xorist ransomware family which emerged in 2016 . The hackers have repacked the original infection with a trial packer which allowed them to distribute it as a new threat and add Crypto1CoinBlocker malware to the infamous category of undecryptable crypto-ransomware . Indeed, the RSA-2048 encryption algorithm that the virus uses to encrypt infected computer files is one of the most complex ciphers that is commonly used in the military. So far, various cryptologists around the globe have tried but not managed to decipher this code. This means that the Crypto1CoinBlocker-affected files may remain locked permanently. Nevertheless, you should not lose hope, because virus analysis professionals often find ways to bypass such encryption by finding weaknesses in the virus source codes . But it might take a while before a decryption tool is invented, so you should decontaminate the virus to be able to use your computer. One of the software we recommend for Crypto1CoinBlocker removal is Reimage. This program will automatically scan your device and delete all the potentially dangerous components for good. An interesting thing about Crypto1CoinBlocker is that though the virus is clearly a descendant of the Xorist virus, it also applies elements of other ransomware. For instance, the pop-up window with ransomware instructions is adapted from CryptoLocker , and the hackers have not even bothered to eliminate the name of this ransomware from the title of the pop-up. In general, the ransomware seems to be very offhandedly made, which is an immediate red flag suggesting that the virus developers should not be trusted. In fact, we do not recommend relying on any cyber criminals that use extortion techniques to make money. Even if the ransom does not seem that great (in the case of Crypto1CoinBlocker its 1 Bitcoin), it is not recommended to make any transactions because you may not even receive the decryption key and be robbed of your money as well. Keep in mind that the hackers will do their best to convince you to open up your wallet. This particular virus does not only launch a pop-up but also drops HOW TO DECRYPT FILES.txt note on the browser and appends all of the infected files with .1AcTiv7HDn82LmJHaUfqx9KGG55P9jCMyy extensions — a Bitcoin wallet address to which the ransom must be transferred. If you do not succumb to the pressure and remove Crypto1CoinBlocker from your computer, you may then try to decrypt your files using our recommended recovery instructions. Like most ransomware, Crypto1CoinBlocker creators use infected spam emails  to spread this malicious payload around. To ensure a better infiltration rate, the scammers use social engineering techniques to convince the users into downloading the infected documents. It is important to note is that the virus downloaders may come obfuscated in completely regular files, such as Word documents, PDFs or pictures. So, a way to expose a potentially infectious email is to look at its sender and the contents of the email. If you are not familiar with the sender or you have received an email from some institution you normally have no business with, it might be that these messages are carrying some malware. Currently, Crypto1CoinBlocker has been noticed spreading as Invoice_pdf.pif file, but there might be tons of other file names that the virus may acquire in order to infiltrate users’ computers undetected. Crypto1CoinBlocker virus is a cyber infection that should be approached with the utmost attention and caution. Although it may not seem like a serious threat looking at its careless ransom notes, you should keep in mind that it is a full-fledged ransomware that has been designed to wreck your computer, so you should be careful and use only the most reputable anti-ransomware tools to remove Crypto1CoinBlocker from your computer. Nevertheless, we understand that some users may not have the funds or the devices capable of running some expensive and heavyweight security tools. For this purpose, we have prepared Crypto1CoinBlocker removal instructions which will help you solve this issue manually. Log in to your infected account and start the browser. Download Reimage or other legitimate anti-spyware program. Update it before a full system scan and remove malicious files that belong to your ransomware and complete Crypto1CoinBlocker removal. When a new window shows up, click Next and select your restore point that is prior the infiltration of Crypto1CoinBlocker. After doing that, click Next. Once you restore your system to a previous date, download and scan your computer with Reimage and make sure that Crypto1CoinBlocker removal is performed successfully. Guide which is presented above is supposed to help you remove Crypto1CoinBlocker from your computer. To recover your encrypted files, we recommend using a detailed guide prepared by 2-spyware.com security experts. How can Windows Previous Versions feature be used in data recovery? If you have been smart about the security of your data and had enabled System Restore function on your computer, you may as well try recover your files using Windows Previous Versions feature. In a brief guide below we explain how to use this Windows function properly. Will ShadowExplorer help you recover your files? ^ Catalin Cimpanu. Xorist Ransomware Family Is Now Decryptable for Free. Softpedia news. ^ Daniel Stoyanov. Crypto Ransomware Attacks Increase By Almost 500 Percent in One Year. Virusguides website. ^ No More Ransom expands with new partners and decryption tools. Networks Asia news. ^ Antonios Papadimitriou. CryptoLocker Ransomware Is on the Rise — Here’s What to Do if You’re Attacked. Security Intelligence Analysis . ^ Robbie Harris. Internet Scams, Hacks and Malware: A Cat . Wvtf.org news site. This entry was posted on 2017-01-19 at 01:49 and is filed under Ransomware, Viruses. You can quickly scan the QR code with your mobile device and have Crypto1CoinBlocker ransomware virus manual removal instructions right in your pocket. How did you remove Crypto1CoinBlocker virus?